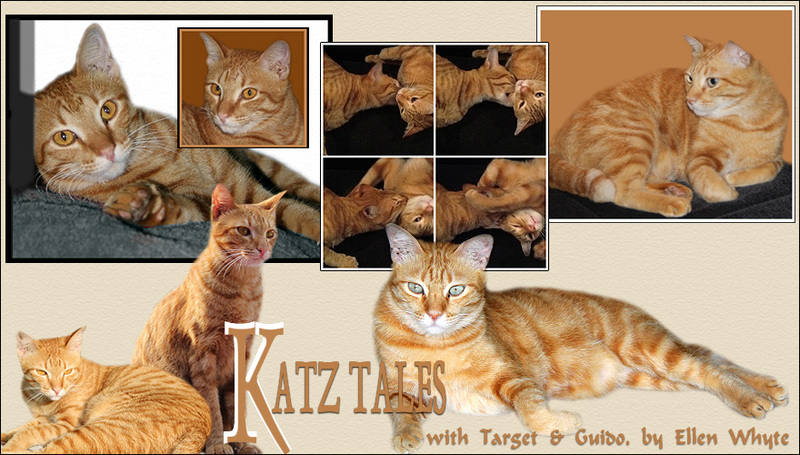 Katz And Other Tales: Au Speaks Out: World Cat Day! Au Speaks Out: World Cat Day! Guido picked her out. We'll show you how he did dis in a few days bekos today is resurved for de other speshul annownsemunt. Today is World Kat Day! All of us kats online are celebrating. You kan see us all at the cat blogosphere. Happy World Cat Day! Especially to the winner of your contest! That's the purrfect way to spend World Cat Day...or any day for that matter!! Happy World Cat Day!! happy world cat day! thanks for reminding the furries at home deserve something speshul today too! haappy furry cat day !! Happy World Cat to all of you !!!! COD ! You guys already been spoiled rotten, I can't wait till my pawrents come home ! Hello Au, nice to meet you. We like your recommendations for World Cat Day and we're going to make sure our mombean sees these and follows through! Happy World Cat Day!! And Congrats to the pawsome winner of your contest!!! 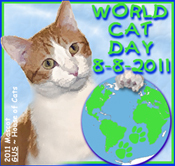 You have come up with some great ways to celebrate World Cat Day! Great way to celebrate the day. We hope you get everything you asked for, especially a servant for every cat. Happy World Cat Day. Another half hour and it will be tomorrow here too. Our post is set to auto post. Happy World Cat Day! Concatulations to the winner too! Au, theese is a most excellent post! Great job buddy! I bets you will get some great foods (some fine baked ham or chicken, whoa it's making me hungry just thinking about it! )today at your house! Happy World Cat Day to you and Target and little Guido! Continued purrs to Target. Happy World Cat Day, Au! You definitely know how to enjoy it! Happy World Cat Day to all three of you! Awwwww!! HAPPY WORLD CAT DAY wonderful Au, Target and Guido!! Me and Charlie love all these purrfectly reasonable demands!!! We hope all kitties are provided these and more! Yay!!! Happy World Cat Day, darlings! I am glad Thanny won! She is one of my facebook friends. I met her at the SPCA Take A Leash campaign. I hope you guys get your favrut foods all day long. Happy World Cat Day! Wot a wonderful way to spend the day. Smoochies. Happy World Cat day to all of you too. What a nice post. We hope you get all those wonderful things. Plus thanks for asking for homes for all the homeless kitties. Take care. Au, we think your demands are purrfectly reasonable and hope you get to spend the day with all of those wonderful things. Great pictures gang! Happy World Cat Day! Happy Cat Day, my friends! we hope to be up to speed commenting by next week...secretaries...sheesh. Happy Belated World Cat Day...I was extremely busy and missed it. :( Have to make it up to my kitties. Me too hope that every cat in the whole wide world would have good homes and servants !!! Happy World Cat Day - hope all your wishes come true. Buddy Said: "Happy World Cat Day everbodies. I laks da wants you guys gots listed. We has most of dem, and prolly a bit more dan mosts of da kitties what gots furrever homes. Our Beans not works nomores so we gots dem under paw all da times. So dey into dere duties rightly sharp lack. An I agrees dat ANY day be a goody day what for havin a Happy World Cat Day." Happy World Cat Day! Indeed! May every cat without a furrever home get a loving, yummy, fresh water to drink home! HAPPY WORLD CAT DAY! We hope that all of your wishes came true! Happy World cat day to you. It looks like a purrfect day. Happy World Cat Day! I like your list of demands! Hope you got all your wishes today! We want to thank you for your kind concern for our Chica. Happy World cat Day to You!!! Happy World Cat Day, Au, Target and Guido! And congratulations, Thanny! Happy world cat day boys! Glad you had a great World Cat Day. We liked your tribute in photos and words. Every day is World Cat Day!!!!! your wishes are purrfect sweet one. many hugs and kissies.